Adding more confusion to an already confusing situation. At the beginning of the week, Hello Games’ head honcho Sean Murray reminded players that No Man’s Sky is “not a multiplayer game.” A day later, he declared “the chances of two players ever crossing paths in a universe this large is pretty much zero,” via Twitter, before two players actually crossed paths. Sort-of. 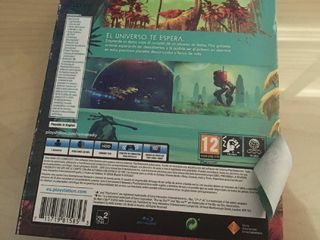 Now, to add to the confusion further still, it appears some limited edition versions of the space faring sandbox have a sticker on the back of their boxes which, once removed, reveal a PEGI 12 rating, a mild violence warning, and an online play icon. So, the big question is: what does this mean? It’s unclear at this stage what online play, as per the icon, actually refers to—it could just mean that players are able to spot shared planet names, as is the case at the moment, as opposed to engage in actual online multiplayer. Why cover up the icon, then? Again, this is unclear but perhaps Hello Games felt this would stir unwelcome speculation from its fervent, although at times irrational, community regarding what is or what isn’t possible—launch delays prompted death threats at one stage, after all. Up to now, Murray and Hello have been somewhat reticent when quizzed about these perceived discrepancies, but we’ll update as and when (or indeed if) things become clearer. In the meantime, here's our impressions after two days with the PS4 version.